Close to the beach, a villa rental in Tuscany for your vacation in Italy. 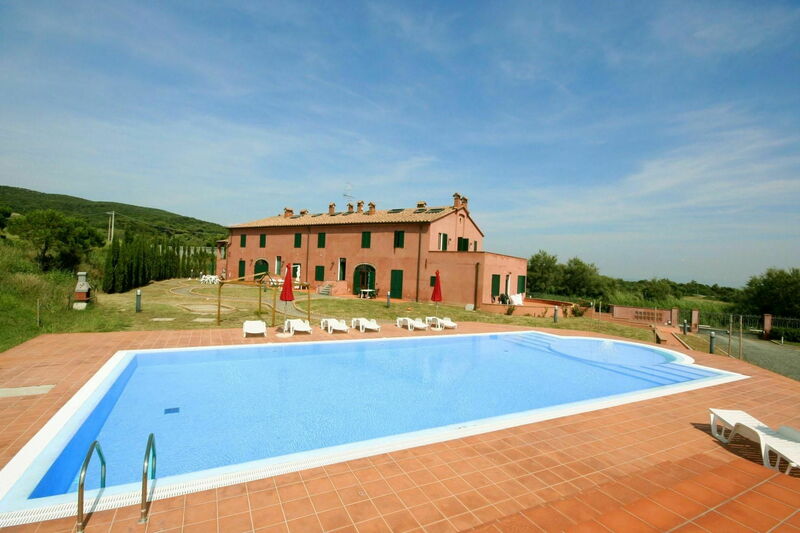 Old farmhouse dating back to the 18th century recently restored and situated on a hill nearthe Chioma park with panoramic views on the sea of Tuscany. The villa rental has been divided into 12 apartments which are nicely furnished in a Tuscany rustic style. Distances: the nice seaside village Castiglioncello with all kinds of shops and train station 1,5 km, Rosignano 5 km, Livorno 17 km, Pisa approx. 20 km. Nice equipped beaches are reachable in a few minutes. The freeway passes near the property. At guests’ disposal: equipped garden, swimming-pool (7 x 16 m – max. depth. 1.7 m - open from 01/05 to 30/09) with solarium, playground for children, barbecue. Shared laundry room with two washing machines. The access to the property is via an unpaved but well-maintained road. Parking within the grounds. Extra services: baby bed (€ 30,- / per week) and extra single bed (€ 50,- per week) available on request, payment on the spot. Maid service available by arrangement (to be paid on the spot). Pets are allowed by paying an extra charge of € 50,- / per week (to be paid on the spot). 1st floor: living-room (TV) with double sofa-bed, dining area and kitchen corner (freezer), large double bedroom with extra single bed, bathroom with shower. Access (from the living-room) to an open gallery with French bed and bathroom with shower.